April 3, 2012 by Venky. 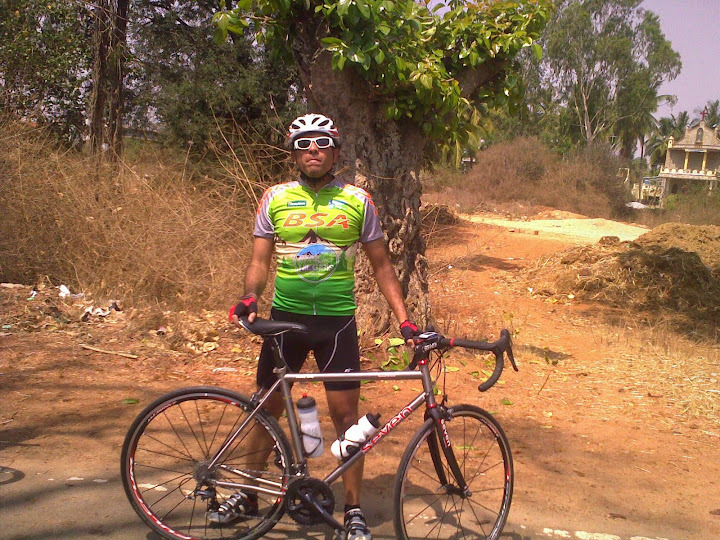 Delliwala Attacks Nandi: A Funtastic Weekend Ride..
A friend and fellow TFN’11er, Akshay Jaitly, was planning to visit Bangalore on Saturday, 30th March, with his new Titanium bike and wanted to take a first crack at Nandi. He was landing around 9 am on Saturday and wanted to start riding straight from airport. So, a few of us TFN alumni decided to welcome him and join him on his first Nandi ride. The problem was that, Iate morning starts and I don’t go well together. So, I told the guys that I will start a bit early and complete the climb before they come and will join them again for the climb. Ze Rain and Ze Flat.. I started riding around 6 am with the plan to get to Nandi base by 8 am. I started riding towards Hebbal-Yelahanka so that I can take Shankar’s road to Nandi base instead of the usual Siva’s road. As I got to Hebbal it started drizzling slightly. As I went past Yelahanka police station, I noticed a puncture on the front tire. It was a small stone that tore through the tire and punched a hole in the tube. Luckily, I was carrying some tire boots(a cut Fair&Lovely tube). I booted the tire and fixed the puncture and started riding again. By that time, the bike was no longer white. It was the first ride on it after washing it a couple of days back and it was dirtier than ever within the first 20km of the ride. Although I was concerned with the aesthetics of the bike, I was thoroughly enjoying the pleasant weather and the calm scenic beauty on Shankar’s road. As the sun began to make its way up around 8:30 am the drizzle disappeared and I reached Nandi base. There was no sign of anyone on bicycles as I began to climb. I decided to climb in Z4 and paced myself through the climb. I was contemplating doing repeats of either the steeper section or the first 5km but in the end completed the climb non-stop in nearly 29mins. Then, with a lot of time left for the others to arrive, I descended about 2.5km and repeated the steeper section. After that, instead of doing any more repeats, I thought of riding back and meet the guys on the way back and ride back with them. Halfway through the descent however, I noticed the familiar sight of Dipankar Ironman Paul on Nandi. He apparently got bored riding alone midway through the climb and started to turn back just then. We descended together and stopped for breakfast at the base before starting to ride back. We ran into the TFN’11 alumni group on the Nandi approach road. We stopped and chatted with Akshay, Arvind, Ameet, Siva, Vasu and Manish. Akshay Jaitly, the Delliwala! Celebrated the new bike with an awesome climb of 27:56min! Akshay came with his new Titanium bike specially sized and setup for him in NY. It is a real beauty. It is going to be the first Nandi ride both for him and his bike. Arvind was riding his new steel fixed gear bike named ‘Steffi’. It is one hell of a looker. It is the best looking fixed gear bike I have seen in person till date. Siva was on his SE Lager fixed gear bike and Vasu was on a loaner bike that looks strikingly similar to his own bike that was getting serviced. Ameet was on his red CAAD8 and Manish was on the LOOK bike that he bought from Muthu after his TFN’11. After a few snaps and a bit of chatting, Dipankar and I began to ride towards Siva’s road. On our ride back after about 5km or so, I casually mentioned about how I was in double minds to join the guys for Nandi again and spend some more fun time with them. I told that I didn’t want to ditch him on his ride back and hence didn’t do so. Funnily enough, he said he wanted to do that too but didn’t want to ditch me on the ride back. On the spur of the moment we turned back and started to paceline to chase them down. We knew we were unlikely to catch them before they reached base but we got there in good time none the less. It was a good hard race like effort for 15 mins or so. After reaching the base, we repeated the first 5km of the climb and joined the rest of the guys at base. TFN’11ers, Vasu, Akshay, Arvind and Siva chatting up at the base after the climb..
Fun Games On The Ride Back..
At the base the Cleated Warrior clan reps, Tusker and Gana were having breakfast along with their friend, Deepak Mhasavade. Since Akshay, Arvind and co were going to ride back towards the Airport, Dipankar and I decided to ride back with Tusker and Gana via Siva’s road. Vasu, Tusker Kiran and Gana at Nandi base before we started our ride back.. I began to draft Tusker and kept losing his wheel as he scurried ahead time and again. Then I challenged him to a coasting race on a downhill and he won the race hands down. Getting tired of losing like this, I threw him another challenge with a coconut water drinking contest which I manged to tie. Both of us managed to down 4 fresh coconuts each. Just after we crossed Devanahalli, I noticed that the front tire on the Lemond lost air again. I pumped it up when on the way back on Nandi road when I noticed a slow leak on it. I hoped that it will last me till I reach home but apparently not. So, the guys stopped for me and helped me change the tube. Tusker noticed that the puncture that I fixed in the morning just came off. I received a mouthful of craftsmanship awards from Tusker, for my puncture fixing abilities, before he helped pump up the new tube. As we started riding again, I continued to draft Tusker but just as we got on to Siva’s road, I decided to see if drafting a truck would be any better than drafting the tusker. For the first time in all these years, I tried drafting a truck and I began to see speeds close to 55-60kmph on flats. Being the motorpacing newbie that I am, I was keeping a fair distance from the truck accounting for any sudden slowdowns from it. But Dipankar was doing much better and was a bit closer to it. Eventually, I lost the draft and fell behind and Dipankar gave the draft up looking that I got dropped. He persuaded me to join him to chase the truck down and catch the draft again. We ended up racing like hell but I gave up the fight just as we were about to catch it on an incline. The Ironman has, by now, realized what a crybaby I’m when it comes to hard efforts and decided to ease up on me. By this time my legs have already had a quite a few sprints and race like efforts, along with a couple of hard Nandi climbs and began to plead with me to ease up on them. Dipankar and I decided to stop and wait for Tusker, Gana and Deepak in the last village on Siva’s road while refueling with some bananas and cool drinks. By this time it was close to 2pm and the sun was beating down hard. After drinks, Dipankar and I bid goodbye to the rest and rode towards KR Puram and parted ways towards our respective homes.